From 03 to 07 January 2018, Korston Club Hotel Moscow invites children and their parents to visit the New Year show "The Mystery of the Old Clock", which will take place in the beautiful hall of the Plaza de Paris where everyone can feel like a guest of a magical castle. New Year is the most fabulous and long-awaited holiday for every child, so the organizers of the event tried to make sure that for adults and children this holiday was remembered for a long time. "The Mystery of the Old Clock" is an interactive fairy tale-ball, in which children become the main participants of the performance. Light show, circus artists Dussales, dance numbers, acrobats, conjurers, mimes and much more are waiting for the guests of the show. Smart new-year suits and dresses are welcomed by the organizers and will be marked by special prizes and gifts. In addition, all the young guests of the show are waiting for a sweet table and a real New Year gift, already included in the ticket price. And for the parents, the organizers prepared a small bonus in the form of free entrance and parking near the hotel. 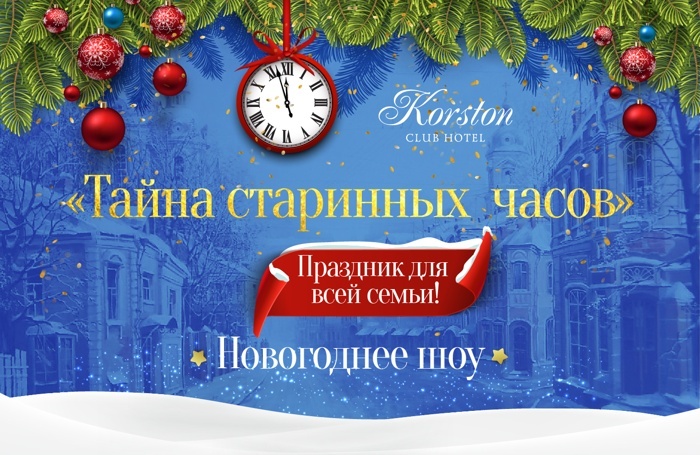 The fairytale town of Korston is ready to receive its guests and immerse them in an atmosphere of magic and celebration together with the New Year show "The Mystery of the Old Clock".